Today, we have another great royal giant spawner deck for Arenas 8 and 9 in Clash Royale! This is another one of our fan submitted decks, which you can earn free gems for submitting! Lets go ahead and get into the strategy and gameplay of this Clash Royale royal giant deck! The strategy of this deck is to overwhelm your opponent with spawned troops and then surprise him with the royal giant. This deck is extremely expensive because it’s average elixir cost is 5.1, but you won’t be needing to use elixir very frequently because your should always have your opponent defending. The pump should also be providing enough elixir to help get you through the match. This deck is excellent in arenas 7 through 9, but once you get to 3200 trophies, it will be much harder to win. If you have a building in your starting hand, wait for 10 elixir and then deploy the building. If it’s the elixir pump, place it in the corner behind one of your arena towers. If you have one of the huts in your starting hand, place it in the center a couple of tiles in front of the king tower. You want your opponent to panic and make careless errors because he’s worried he will be overwhelmed by your huts. Just keeps cycling through your cards with archers and wizard and barbarians back in order to get back your elixir pump. Also, keep placing huts down, pushing on one side of the arena. Use the tesla to defend against any building-targeting troops. Get down huts as fast as you can and make sure you always have at least one elixir pump down. Counter your opponents pushes as necessary with your other cards. Keep placing down buildings to keep your opponent from building up any big push. There may be a point where you have a massive buildup of spawned troops. 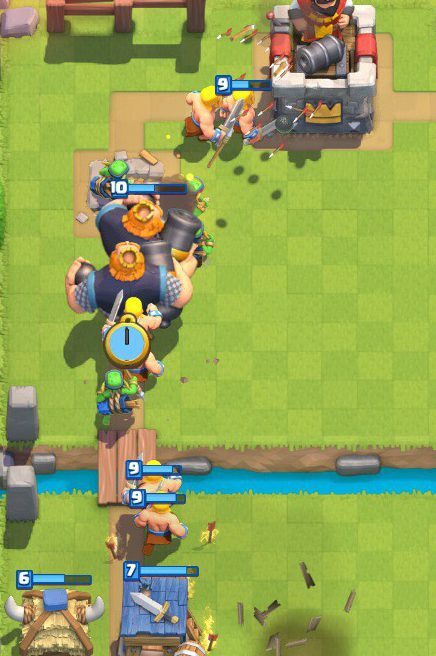 When you do see a buildup of troops, deploy your royal giant along with those troops. The opponent will be caught off-guard for a moment and won’t know how to react to your royal giant. 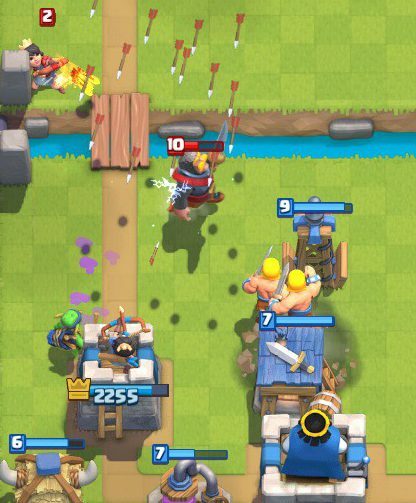 Try to have a wizard or archers supporting the royal giant when you deploy him. Keep defending according to your opponents pushes. You don’t want to get careless with the huts and lose a tower. If you are playing the strategy correctly, you will most likely have gotten a tower by now. Don’t lose awareness of your opponent’s offensive pushes. This is when you begin to go on all out on offense. It’s all or nothing at this point with this royal giant-spawner deck. 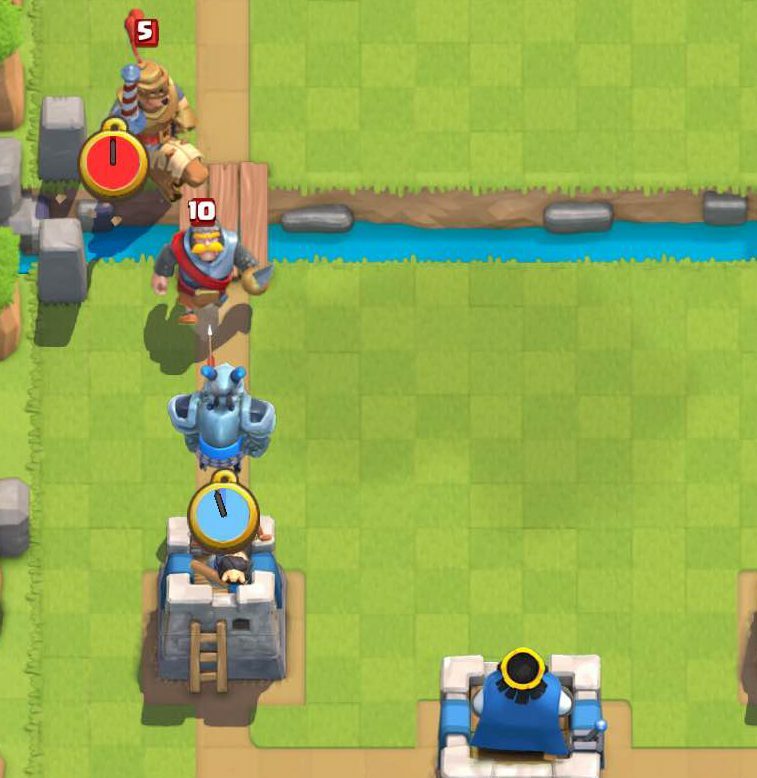 At this point in the battle, you’ll just be going through all of your cards and trying to cycle back to your royal giant. Keep your opponent overwhelmed with your many huts. You’ll be able to cycle through your deck very quickly, so if you already have a tower, keep dropping royal giant in the center on your opponent’s side. At this point, you’ll want to have at least two elixir pumps down to be doing work for you. Keep spamming as many huts as you can, and you’ll eventually get the second tower. If you do get the second tower, then just go for an all out three crown, and make it look awesome. Keep defending your opponents pushes as necessary. Don’t get careless with your defending or you may end up making a careless mistake that will cost you and possibly cause you to lose the battle. Thats all the information you need to know to succeed with this Clash Royale royal giant spawner deck! If you want to earn free gems for submitting deck guides, click here. Thanks for reading and check back soon for more Clash Royale content! Pingback: Royal Giant Spawner Deck for Arena 8 and 9 | Clash of Clans Guide, Strategies, Tricks and More! How do you give free gems to us without hacking? Check out our submit decks tab! Hey Clash For Dummies, I’m in arena 8 at almost 2500 trophies and tesla is probably the worse defense building I can thing of. And royal giant in arena 7 or the beginning of arena 8 won’t be at level ten, for sure. So, how do you find out if the deck is even so good. For example, I can beat it easily with my miner+minion horde+lightning decks. And lightning is one of the huge mega cards right now. PS, how do you give us free gems, cuz the only way I can think of getting free gems is to hack or one of the Supercell officials actually giving us them? It is good against some decks and bad against others…. if it wins most it must be a good deck. For free gems, I give an iTunes or Google Play GC which you can spend on gems! 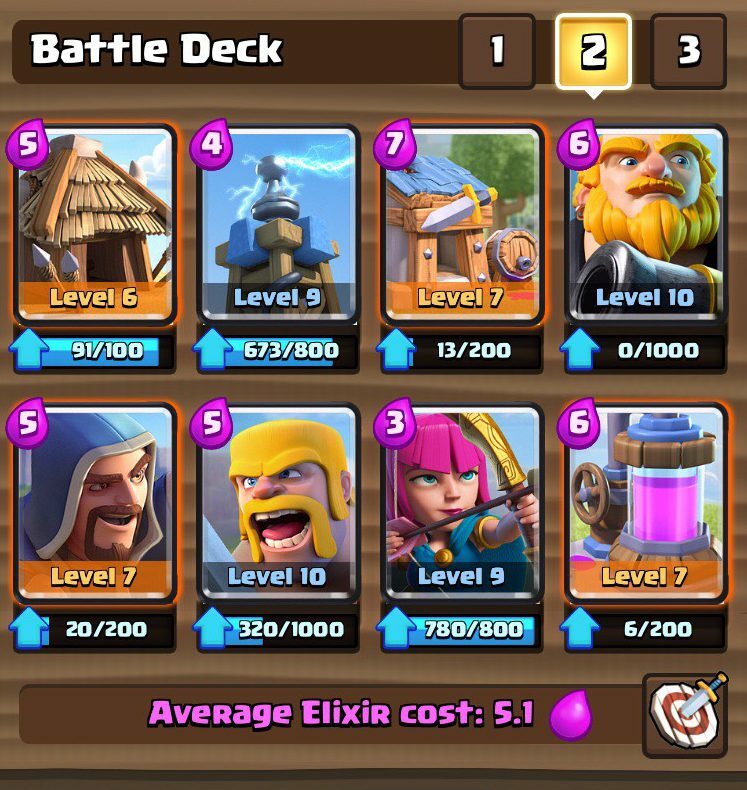 what about my lava hound miner deck I sent in? Haven’t gotten to it yet; I don’t have access to my computer yet. I hate those decks… But then, according to my friend, whatever you don’t like, you don’t like it because it works too well, so you should use it instead.